India’s first F1 driver-would make his Formula 1 debut in 2005 at Melbourne in the first GP race of the year at the age of 28, and be part of the new Midland F1 team, continuing to run cars under the ‘Jordan-Toyota EJ15’ name, for the last year in 2005. It would give Eddie Jordan, the bonus of a 15th year nominally in F1. Historically, it will be an important landmark for two reasons: one, he is the first Indian driver ever - Prince Bira at the very start of the FIA’s F1 World Championship from Thailand, and Alex Yoong, from Malaysia in 2001 and 2002 remain the only other non-Japanese Asians ever in F1 - and two, this is the first time since 1984, that both drivers of a F1 team would be F1 debutantes at the very same race. And for a double coincidence, after 21 years, not just is (Midland) Jordan going into 2005 with two debutantes, Minardi too will be doing it in 2005 with two F1 debutantes at the opening race. The last time two debutantes drove for one team, in the same debut race, was when Martin Brundle and Stefan Bellof debuted for Tyrrell, in the first race on March 25th, 1984 at Interlagos, Brazil, of their unfortunate 1984 season, when the Tyrrell’s were stripped retrospectively of all their points for carrying ‘moving ballast’, in the form of lead balls in their water tank. So after 21 years, a newborn team, with its parent’s name, will be debuting with two novices, and the portents are not really favourable. Narain Karthikeyan’s F1 debut was the culmination of a seven-year sojourn through British F3, Formula Nippon and the Nissan World Series, and was partly the result of incredible coincidences, that gave a F1 drive to a driver who even at the end of 2003 was talking of moving to the more lucrative pastures of IRL and USA. In fact, Narain did take part in an IRL test in latter half of 2004 with the Cheever team, since the F1 dream seemed hopeless just then. But the F1 drive did materialize, thanks to the sale of Jordan, and the takeover by the Midland Group. 1998 was a 16-race season with the points scoring system being the 20-15-12 for the three on the podium, 10-8-6-4-3-2-1 for the next seven drivers finishing the race, and an additional point to the driver, recording the fastest lap. During the past two seasons - 1996 and 1997 - Paul Stewart Racing (PSR) had taken the title with Brit Johnny Kane (PSR) beating Nicolas Minassian (Promatecme) to the title in 1997 and another Brit and later F1 driver, Ralph Firman (PSR) beating Belgian Kurt Mollekens (Alan Docking) in 1996. It was therefore expected that PSR would be the team to beat in 1998, having been the dominant team in BF3 in the 1990s. With all the cars chassised by Dallara, the differentiation between teams was achieved in the choice of engines. In 1998, the choice ranged from Mugen, Renault, Toyota, and the Spiess Opel. PSR were the leading Mugen-powered team, and in 1998, two Brazilians, Luciano Burti in the No.1 car and Mario Haberfeld in the No.2 car, formed the strike force in search of a third consecutive BF3 title. The season started at Donington Park on 22nd March, and it was Enrique Bernoldi in the No.5 Dallara F398 Renault of Promatecme who took the pole, the race win and recorded the fastest lap. India’s Narain, driving for Intersport in a Dallara-Spiess Opel F398 qualified 12th with a time of 1m28.844 (to Bernoldi’s pole time of 1m27.476s) finished ninth, 35 seconds behind the race winner. Burti and Haberfeld finished 3rd and 4th in the race. The second round at Thruxton on 29th March saw Bernoldi take another win, with Narain again 9th, again 34 seconds behind. Of the Brazilian duo at PSR, Haberfeld finished 4th, along with the fastest lap of the race, a 1m6.146 (106.146mph) on lap 16 of 19, and Burti followed him home in 5th. The third round at Silverstone a week later, saw Haberfeld take the win, with Narain retiring after only 10 laps of the 20-lap race. Bernoldi was second, and would maintain his lead in the title chase. Three weeks later at Brands Hatch, two rounds of the championship took place, with Narain not present and Bernoldi and Burti took a win each. Round 6 at Oulton Park on May 4th, saw Narain make his last appearance for the Intersport team and their Spiess Opel engines and spun off after just 5 laps. The race win went to Bernoldi in a time of 19m59.895s (108.27mph). Rounds 7 to 10 did not see the Indian make an appearance, but obviously something was brewing. Bernoldi won at Silverstone, Mario Haberfeld at Croft on May 24th in the 8th race, and Darren Manning - going great guns in IRL now - wins at Snetterton and Silverstone (round 10) for Speedsport Racing, also using Mugen power. By now, the title chase had gone awry for Bernoldi. By the end of the 7th round, he had been leading with 119 points to 85 for Brit Martin O’Connell, and the Brazilians of PSR, Burti on 69 and Haberfeld on 65. During the next four races, Bernoldi did not score! By round 10, Haberfeld had inched to 109, helped by that win at Croft, and closed the gap to a mere 10 points. His teammate, Burti was now in 5th place with 81 points. Around this time, July 1998, Portman Racing was taken over by Tom Walkinshaw, and renamed Portman Arrows. Those were the days when the Arrows team was still around F1, unlike today. Also Audi had just bought out TOM'S, the face of Toyota in BF3 then. The 11th and 12th rounds took place on the 16th August weekend at Pembrey, and surprise of surprises, Narain was back as the only driver of a new team, Carlin Motorsport. The events of early 2005, when the Midland Group took over the Jordan F1 team, and appointed Trevor Carlin as its sporting Ddirector, and Trevor Carlin selected Narain as one of the drivers for the Jordan-Toyota EJ15, had their origins here. Haberfeld and Burti won a race apiece at Pembrey, while Narain took a 6th in the first race, and a 4th in the second to start the scoring for Carlin Motorsport in its debut race. By the end of the Pembrey weekend, Haberfeld had taken over the title lead, with 146 points to Bernoldi’s 133, with Burti now 3rd with 109. The next two rounds at Donington Park (30th August) and Thruxton (13th September) did not see the Indian or Carlin Motorsport - teething problems, probably - while Bernoldi won at Donington once again (after the pole, race win and fastest lap in race 1). Haberfeld took 3rd to retain the title lead, and then took the win at Thruxton, with Bernoldi not scoring, to consolidate. The 15th race was at Spa-Francorchamps, and here Narain gave Carlin Motorsport a third place and a first podium finish for the new team, in only its third race. The winner though was Haberfeld with Bernoldi only 4th, and the 1998 BF3 title clinchéd for third consecutive year by PSR. After all, it was only in 1997, that Stewart Racing had entered F1, and here they were winning the BF3 title for the third consecutive year. Haberfeld won the last round at Silverstone to complete a very satisfying BF3 season. Narain finished 3rd, to give Carlin yet another podium. Narain would drive four races for Intersport and score 4 points, and another 4 races for Carlin and score 40 points. Haberfeld would go on to four disastrous seasons in F3000 followed by Champ Cars. F1 Roads 1999: The four F1 debutantes in 1999 would be Pedro de la Rosa for Arrows (which had taken over Hart), Marc Gené and Stéphane Sarrazin for Minardi, and Ricardo Zonta for the new BAR team. Pedro de la Rosa was going into F1 via BF3 in 1993 and 1994, before going to Japan and becoming F3 champion there in 1995, Formula Nippon champion in 1997, and a Jordan test driver in 1998. Gené was coming into F1 via BF3 in 94 and 95, F3000 in 1997, and Open Nissan (2-litre, almost Spanish F3) champion in 1998, while Zonta had the best pedigree of all the debutantes: SudAm F3 champ in 1995, F3000 champ in 1997, FIA GT champ in 1998. The last debutante, Sarrazin, who would have a one-race F1 career, was coming from French F3 and F3000. The 1999 season would also comprise 16 races, with PSR, Fortec, Manor, Carlin and Alan Docking, using Mugen engines, Serge Saulnier’s Promatecme using Renault engines, and SS Sport alone with Spiess Opel. Burti would be the lead PSR driver in 1999, Jenson Button would be the revelation for Promatecme, and Narain would continue with Carlin. It would also see the introduction of combined times for qualifying, a prelude to the practice in Formula 1 in 2005. The first race was again at Donington Park on March 21st, where Button took pole with 1m38.076s (91.76 mph), but it was eventual champion of the year, Brit Mark Hynes, who would take the race win and record the fastest lap. Narain would qualify 3rd and finish 4th, nine seconds behind Hynes. Marc Hynes, who would go from BF3 champion to non-entity afterwards, took the next race at Silverstone in a time of 28m12.036s (105.37mph), the race also seeing Dane Kristian Kolby of Fortec take the pole and record the fastest lap. Narain retired on the third lap after having qualified 9th, his first retirement for Carlin. Thruxton on April 11th would see Jenson Button take his first BF3 win in his 3rd race in a time of 23m42.508s (119.24mph), the race also witnessing another retirement for Narain after qualifying 9th yet again. The next two rounds were held at Brands Hatch, on the weekend of April 25th, and Narain would take a second in the first race and a race win in the second, to go with double pole position in qualifying, and a double fastest lap. Burti would take race win, pole and fastest lap at Oulton Park, while Narain would finish 13th after qualifying 8th, with a time of 1m30.831s(0.73s behind Burti’s pole time). Hynes would go from pole to race win at Croft, more than a month later at the next race, where Burti would record the fastest lap. Narain would finish 3rd, 18s behind Hynes. Then for the 8th race of a 16-race season, it was back to Brands Hatch, where Narain would come from second on the starting grid, to take the win in 29m0.707s (157.181kph) and the fastest lap.in 1m19.859 (190.273kph). This second win of the season would be Narain’s last in regular season-long championship battles until the 2004 season of the Nissan World Series! Hynes took the next race at Silverstone, Burti the race after that at Snetterton, with Narain 5th and 7th after qualifying 7th and 3rd in the two races. The next stop was at Pembrey where two races would take place spread over a fortnight. Jenson Button would take the pole, race win and fastest lap in the first race, and Hynes would do the same in the second. The next stop was Spa, where the combined race with European F3 drivers would take place, with points awarded to the first ten in finishing order, irrespective of the series they were coming from. This was achieved by entering all the entrants in the entry list of BF3. Button would take pole with 2m16.173s, but Burti would take the race win in 28m15.956s (169.190kph), while Christijan Albers, coming from the German series for this one race, would record the fastest lap of 2m17.333 (182.661kph). Tiago Monteiro, coming from the French series, would finish 7th for 4 points in BF3. Surprisingly, Narain, Albers, and Monteiro would make their F1 debut at the same F1 season-opener at Melbourne, in 2005, nearly five and a half years later! After Spa, the 14th race of the 1999 BF3 season, Burti was trailing Hynes in the title chase by 189 to 191 points. The next race at Silverstone, would controversially alter the battle for the title, decisively, after the stewards, stripped Burti of 12 points for the 3rd place. The reason was that at the start of the race, Burti who was on pole with Hynes sharing the front row of the starting grid, made a lateral move in front of the British driver, resulting in Hynes being kept behind. Jenson Button won the race, but Burti who finished 3rd ahead of Hynes in 4th, was disqualified and the Brit promoted to third. The net result of such action was that instead of Burti and Hynes going to the last race dead level on 201 points, they would go to Thruxton with Burti now 189-203 points behind Hynes! Burti was deemed to have acted in an ‘unsportsmanlike manner’ for the blocking lateral move at start, a move so common in F1 in the nineties. The stewards’ action virtually ended the title battle, and though Burti won the last race at Thruxton, Hynes took the title by finishing 4th. So what could have been a super finale with two drivers equal on points, became finally only a matter of partisan achievement. F1 Roads 2000: The four F1 debutantes in 2000 would be Jenson Button, Nick Heidfeld (German F3 champion in 1997, and F3000 champion in 1999), Argentinian Gaston Mazzacane (coming from SudAm F3, Italian F3, F3000 and test driver for Minardi in '99) and Luciano Burti, who would make his F1 debut in 2000 in Austria in a one-off race for Jaguar. Burti’s F1 career would end in 2001, with 4 more races for Jaguar and the next ten for Prost. For Narain, a 6th at Silverstone would be the last of his scoring for 1999, and it would be back to BF3 for another year in 2000. All those named above would enter F1 in the years ahead, except for Tomas Scheckter, son of Jody Scheckter, who would have to make do with the IRL. For the 2000 BF3 season, combined times for qualifying was given the go by, and there were only 14 races for the Championship. Pizzonia was in Marc Hynes’ place in the Manor Motorsport team and Narain had left Carlin to Paul Stewart Racing along with Tomas Scheckter. Bruni would be at Fortec and Sato at Carlin, and all these teams would be running Dallara F300 cars powered by Mugen. Only Nicolas Kiesa would turn out in an Opel-Spiess car, running for Italian-based RC Motorsport. 2000 was also the year that Jaguar entered F1 on their own, and Paul Stewart Racing were without the obvious F1 link of the past few years. Pizzonia would make his title intentions very clear with wins in the opening two races. He would never relinquish the lead in the title chase, and would clinch the title by the 13th race. Pizzonia won a wet race at Thruxton to start proceedings, with Scheckter second 1.9s behind, and Narain 3rd, another 3 seconds further back. Bruni finished 7th, just ahead of Kiesa 8th, nearly 34 seconds behind, while Sato spun off on lap 7 after his team were the only ones starting on dry tyres. The next race was at Croft on 21st April, and Kiesa who was on pole stalled his start, to give the opening that Pizzonia used to record his second consecutive win. Scheckter was second, Bruni 4th, Sato 5th, with both Narain and Kiesa retiring at different stages of the race. The third round was at Oulton Park on May 1st, and this saw Scheckter take his first win, but with Pizzonia second, and less than half a second behind. Narain was 5th, Bruni 6th, while Kiesa and Sato took out each other on lap 7. The next round at Donington Park was a double header, and the first race was won by Ben Collins of Carlin Motorsport, with his teammate Sato spinning out. Narain finished 2nd, Kiesa 5th, Bruni 7th and Pizzonia 11th.Scheckted was out with a collision on lap 13 with Brit Mathew Davies. The second race saw Scheckter take his second win of the season, just ahead of Pizzonia. Kiesa was 7th, Narain 8th, and Sato 9th. Bruni was the only retirement in the race. The next race was at Silverstone on 21st May, and this race saw the top 6 drivers in the Championship, take the top 6 places in the race also. Sato took his first win, less than a second ahead of Pizzonia. Kiesa took third more than 8 seconds behind, but ahead of Scheckter, Bruni and Narain. The 7th race of the season was at Brands Hatch, where Pizzonia took the win ahead of Sato and Narain, and Scheckter 4th, Bruni 8th and Kiesa out of the points in 12th. Next up was another double-header at Donington Park.The first race was won by Pizzonia from pole but in the second race, with new engines from Opel, Kiesa took his first and only win of the season, with his teammate, Kirkaldy second. Pizzonia was third in the second race behind the Opel-Spiess pair. Narain had a 4th and a 10th, as against his PSR teammate Scheckter’s 23rd and 6th. Sato would win the next two races on the trot, in a late-season charge, which would see him win three of the last five races. Pizzonia spun on the opening lap at Croft, where Scheckter finished 2nd, and Kiesa third. Silverstone would see Pizzonia finish second ahead of Bruni, Scheckter and Narain. Pizzonia would return to his usual form, with a pole to chequered flag win at Snetterton in the 12th race, and the tenth round (owing to two double headers). Scheckter would record the fastest lap of 1m1.706s (183.27kph) and finish a second behind Pizzonia, with Narain and Sato 5th and 6th, a further 17s behind. Round 11 and race 13 of 2000 BF3 season was the race at Spa, where drivers from the European F3 series, also would participate. Sato would take pole with 2m15.019s, but Tiago Monteiro, five years later to be Narain’s teammate at Jordan in F1, would come from 2nd in the starting grid to win in 30m4.938s from Pizzonia and Narain, with Bruni 4th, Scheckter 5th and Kiesa 6th. Sato would also record the fastest lap at 2m17.859s (182.86kph), but would be last to be classified at 23rd, one lap behind. Since the ASM and JB Motorsport teams from French F3 were not eligible for BF3 points, Pizzonia would take the 20 points for his second place, and with it the 2000 BF3 crown. The last race at Silverstone was won by Sato in 31m11.567s (178.12kph) with Scheckter 3rd and Bruni 5th. F1 Roads 2001: Formula 1 in 2001 would not see any of these BF3 drivers on the grid, though Sato would make it in 2002, Pizzonia and Kiesa in 2003, Bruni in 2004 and Narain in 2005. The six F1 debutantes in 2001 would be Juan Montoya (in BF3 in 1996, then F3000 champion of 1998, CART 1999 champion, and Indy 500 winner in 2000), Kimi Räikkönen (coming from only Formula Renault), Fernando Alonso (Formula Nissan 2-litre champion in '99 and F3000 in 2000), Enrique Bernoldi (in BF3 in 1998, and then two years in F3000), Tomas Enge (coming via German F3 in '97 and '98, and F3000 in '98-'00) and Alex Yoong (BF3 '97-'99, F3000 also in '99, and Formula Nippon in 2000). After 3 years in the 2-litre cars of BF3, Narain was off to the 3-litre cars of Formula Nippon for 2001. This series, which has had its share of European winners (Ralf Schumacher in '96, Pedro de la Rosa in '97 being notable, among the seven European champions till 2004) is a difficult terrain for the first Indian driver in Formula Nippon, with language and diet differences. There were ten races in 2001, and Narain was in the No.20 Team Impul Reynard-Mugen 2KL car, with his teammate being Satoshi Motoyama, 6 years older, and already a F Nippon champion in 1998. Motoyama, who would win again in 2003 for his triple crown, won 4 races to beat the early pace setter, Naoki Hattori. Ralph Firman, who would take the title in 2002, had wins in the last two races of the year at Motegi and Suzuka, and would be the only non-Japanese winner in 2001. The only other Europeans in 2001 in Formula Nippon were German veteran Michael Krumm, and Portuguese André Couto, who would join Narain in the Nissan World Series for the next three years. Narain’s best finishes would be at the first race and the last race, both at Suzuka, where he finished 6th. With the points system in F Nippon being the 10-6-4-3-2-1 of F1 and F3000, these would be his only points for the year. Part of the problem was his inability to come to terms with qualifying: 18th, 14th, 11th, 12th in first four races, then a 7th at Suzuka, 12th, 6th at Fuji, 7th at Mine, 13th, and 16th. So while his teammate would coast to the title by the ninth race, Narain would finish 15th with just those 2 points from his 6th place finishes in the first and last race at Suzuka. F1 Roads 2002: The F1 debutantes in 2002 were Felipe Massa (F Renault Eurocup champ in 2000 and Euro 3000 champ in 2001), Sato (BF3 champ in 2001), Mark Webber (BF3 in 1997, FIA GT in '98, F3000 in 2000 and 2001, and Benetton test driver in 2001), Anthony Davidson (BF3 runner-up to Sato in 2001), and Allan McNish (BF3 runner-up in 1989, F3000 during 1990-2, Benetton test driver 1993, Lola test driver 1994, F3000 in 1995, Benetton test driver in 1996, Le Mans winner in 1998, American Le Mans Series champ in 2000, and Toyota test driver in 2001). Prior to 2002, an Open Nissan/Formula 2000 Championship was held, based in Spain - almost like a Spanish F3 - with 2-litre engines and whose champions included Marc Gené in 1998, Fernando Alonso in 1999, and Franck Montagny in 2001. For 2002, a new Nissan World Series, with identical Dallara SN01 chassis and 3-litre Nissan engines was launched, and it attracted many ex-F1 stars as well as the slightly older F1 aspirants, and in its 3 years of existence before being merged with the Renault V6 Eurocup for 2005, provided stronger racing than the International F3000 that also ran identical cars - Lola chassis and 3-litre Zytek engines. The points system for 2002, was the same as BF3:20-15-12 points for the first three, 10-8-6-4-3-2-1 for the next 7 drivers, and with 2 points for the driver recording the fastest lap. There would be nine rounds of two races each, with the first race at each round being a shorter sprint race, and the second a longer race with a mandatory pitstop. For 2002, there were 10 teams and 20 cars in the fray, and would see 32 drivers take part eventually. The last two rounds were held outside Europe, in Brazil, and five of the rounds were held at F1 venues: Jarama, Monza, Magny Cours, Barcelona, and Interlagos. Ricardo Zonta, SudAm F3 champion 95, F3000 champ of 1997, FIA GT champion 1998 and F1 driver for BAR in 1999 and 2000, and Jordan test driver in 2001, would dominate the one-make series with nine wins in eighteen races. Frenchman Franck Montagny would win 4 races, Belgian Bas Leinders and Brit Justin Wilson two each, and another Frenchman, Jean-Christophe Ravier, took one win at Albacete. The first round at Valencia saw Zonta and Montagny win a race each, Zonta winning both the races at Jarama, Ravier and Leinders splitting the races at Albacete, and Leinders and Montagny doing the same at Monza. Zonta won both races at Barcelona, and the first race at Valencia. Wilson then won the second race at Valencia. Then the series was off to Brazil and Zonta won both races at Curitiba, before teammates Montagny and Wilson split the race wins at Interlagos. For Narain, the driver whose Road to F1 we are following, the only podium finish would be a third in the longer race at Jarama in the second round. Two 4th places at Curitiba in the sprint and Interlagos in the longer event, a 5th at Valencia, a 7th at Interlagos, three 9th places and one 10th place would make for his nine finishes in the points. The actual highlight of his season would be a pole in qualifying for the longer race in Curitiba, where he would only finish 9th in the race. The team winning the honours would be Racing Engineering with its two drivers Montagny 2nd in the Championship and Wilson 4th. Narain with 51 points would finish 9th. The only F1 debutante from this series in F1 in 2003 would be Brit Justin Wilson, who was also the FIA’s International F3000 champion of 2001. 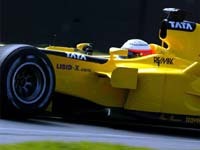 Zonta would become Toyota’s test driver and get 4 F1 races in 2004. F1 Roads 2003: The F1 debutantes in 2003, would be Antonio Pizzonia (he had spent 2001 and 2002 in F3000), Justin Wilson, Ralph Firman (BF3 champion in 1996, Macau winner in 1997, Formula Nippon champion in 2002), Nicolas Kiesa (who had gone to German F3 in 2001, and F3000 in 2002 and 2003), Zolt Baumgartner (German F3 in 2000 and 2001, F3000 in 2001-2003), and Cristiano da Matta (the CART champion of 2002). In a series with identical cars, Montagny, the test driver for Renault, swept though the 2003 series with nine wins in the 18 races, held over nine rounds as before. Only difference over 2002 was that all the races were held in Europe in 2003, though the 2nd round was held at Zolder in Belgium, the 5th round at Lausitz in Germany and the 6th at Spielberg in Austria. Montagny had changed to Zonta’s team of last year, Gabord Competicion for 2003. Though Montagny would take only 4 pole positions in qualifying in the 18 races of the year, he set the tempo with a double win in the opening round at Jarama, a win in the second longer race at Zolder in the second round and another double win at Magny Cours, the third round. Those five wins in the opening six races would be followed by single race wins at Monza in round 4 and Lausitz in round 5, Spielberg in round 6 and Barcelona in round 7. The remaining nine race wins were spread out among 7 drivers with Belgian Bas Leinders and former F1 driver, Brazilian Enrique Bernoldi winning two races each. Montagny’s new teammate Finn Heikki Kovalainen would win his first race at the Lausitz and the Frenchman with just one F1 race in his career (Brazil 1999), Stéphane Sarrazin, would win a race at Monza. Spaniard Marc Gené, after two seasons for Minardi in F1 in 1999 and 2000, and then test driver for BMW-Williams F1 team, and for whom he would drive at Monza in 2003 (deputising for a concussed Ralf Schumacher) would win the first race at Zolder in the second round, while fellow Spaniards Vilariño and Villamil would win a race each at Barcelona and Valencia. Narain would finish 4th in the championship with 121 points. Narain in the No.24 car and Frenchman Bruce Jouanny in the No.25 were driving for Carlin Motorsport in 2003, making their debut in the Nissan World Series. He would start the year with a retirement and a 5th at Jarama, after qualifying 4th and 10th. He would follow that with a 4th and a 3rd at Zolder, after qualifying 4th and 9th. A retirement in the first race at Magny Cours would be followed by 4th in the second race, two 3rd places at Monza, and a 6th and a 4th at Lausitz. A 4th in the second race at Spielberg, would be followed by a 4th and his best finish of the year, a second at Barcelona. A 9th, a 7th, and two retirements would complete his year. His teammate Jouanny would finish 10th with 62 points. Carlin, with 183 points, would finish 4th in the team competition behind Gabord (375), Racing Engineering (238) and Epsilon-Euskadi (214). The F1 debutantes in 2004 would be Christian Klien and Timo Glock (both from the inaugural Euro F3 series of 2003), Giorgio Pantano (German F3 champ in 2000, F3000 for next 3 years, 2nd in 2002, 3rd in 2003) and Gianmaria Bruni (who had gone to Euro 3000 in 2002 and 2003, and was test driver for Minardi in 2003). The last Nissan World Series in 2004 was Narain’s last stop on his F1 road. The cars of the Nissan World series in these three years were identical cars made up of the SN01 Dallara chassis powered by the 3-litre V6 Nissan engines. Narain Karthikeyan was one of the few present in all three years of the Nissan World Series. Narain entered this series in its inaugural year in 2002, after a disappointing year in Formula Nippon, and he was there at the end in 2004. From 2005, the Nissan World Series is being merged with Renault Sport’s Eurocup Formula Renault V6 to form a new series, The World Series by Renault European Championship. Narain finally won two races in his third year in the Nissan World Series and thus complemented the two wins in British Formula 3 achieved in 1999. Ironically, 2004 started with Narain changing teams in the Nissan World Series, from Carlin Motorsport, whom he had helped debut in 2003 in this series, to Italian-based RC Motorsport, with whom he had entered the series in 2002. The landmark wins came on April 23rd at Magny Cours, the venue for the Formula 1 GP for the past fourteen years and on October 17th at Valencia. The 2004 World Series also consisted of nine rounds of two races each at venues in Spain, Belgium, France, Germany and Portugal. The points system for this series had been revised for 2004 with 15 points to each race winner, 12 and 10 points for the other podium spots, and 8-6-5-4-3-2-1 points for those placed fourth to tenth in each race, with the driver recording the fastest lap in each race getting an additional two points. Narain Karthikeyan won two races but the story of the 2004 series was the keen title fight between the new Spanish ‘superteam’ Pons Racing and British team, Carlin Motorsport. Pons Racing were making their debut in the Nissan Series this year. Carlin Motorsport were in their second year in this series, after having made their debut with Karthikeyan in 2003. Both teams won six races each in 2004, but it was Pons Racing taking all the eventual honours. The drivers’ championship went to young Finn Heikki Kovalainen, while his team Pons Racing, took the team title in its debut year. Narain had the satisfaction of helping his team RC Motorsport finish sixth and thus secure the vital last berth in the new series being organized by Renault Sport. And at the expense of Gabord, who are out of the new series. But in the end, the F1 seats were all that mattered. For Tiago Monteiro, the 2004 season was a turnaround from his form in Champ Cars 2003, and F3000 in 2002. In 2002, Monteiro finished pointless from 12 races, as against his then teammate, Sébastien Bourdais claiming the title for the Super Nova team. And in Champ Cars, Monteiro finished 15th in the final standings with his best race being only a fifth place at Mexico while Bourdais. also making his debut in Champ Cars, won three races and finished fourth in the final standings. In the three years of its existence, the Nissan World Series has been known more for getting its drivers F1 test roles, rather than the actual driving seat itself. In fact the only other driver to get a F1 driving seat during the three years of this World Series has been Brit Justin Wilson who got into the Minardi-Cosworth PS03 in 2003 after finishing fourth in the Nissan World Series in 2002. But Wilson was also the F3000 champion of 2001, and which series played what part in the final decision will remain a matter of debate. But for the F1 drives secured by Karthikeyan and Monteiro, the 2004 World Series can rightly claim most of the credit. A number of events conspired to give Narain this break, and most were present at this Championship. The first of these was that Carlin Motorsport, headed by Trevor Carlin, was in its second year in this Nissan World Series, and Narain had helped debut the team in 2003. Narain was the driver with whom Trevor Carlin launched Carlin Motorsport in 1998 in British Formula 3. Then, in the World outside, a Canadian firm - the Midland Group - headed by Alex Shnaider, announced its plans to enter Formula 1. Shnaider, born in Russia, had emigrated to Canada in 1982 from Israel, where his parents had taken him soon after his birth in 1968. The Midland Group had grown since being formed in 1994, with considerable acquisitions in Ukraine, Russia, Armenia and Serbia. As Shnaider says "…for a global business conglomerate, the search for a communication platform is natural. … only three events met our criteria… the Olympic Games, World Cup Soccer and Formula 1….as the two others are quadrennial, Formula 1 was the natural fit." Originally, their intention was to form their own team - "Midland Group is an investment company, and by creating a new team, we are creating value". And as the first step, Trevor Carlin was named as sporting director of the Midland F1 project. Events in early 2005, with Eddie Jordan firm on quitting F1 after 14 years, then effected a change in the Midland Group’s plans and at the end of January, the sale of the Jordan F1 team to the Midland Group was announced. All that was left for Eddie Jordan was the continued presence of his name in his fifteenth year in Formula 1, with the new 2005 cars named the Jordan-Toyota EJ15. And so it came down to Trevor Carlin to select the drivers who would drive for the new team in 2005. The decision on the choice of drivers was logical, though unforeseen by anyone. Carlin opted for Narain, the driver who had left Intersport halfway through the British Formula 3 season in 1998 to drive for the then newly formed Carlin Motorsport team, as well as debuted his cars in the Nissan World Series, and Portuguese youngster Tiago Monteiro, who had done such a good job for Carlin in the 2004 Nissan World Series. The 2005 F1 season will be will be the last season of the V10, 3-litre engine formula, reducing to V8, 2.4-litre engines from 2006. The 2005 season will see a record nineteen races, including one in Turkey. Reliability will be a key issue, with engines being required to last two race weekends, instead of one. And only one set of tyres to last both qualifying and the race, with a combined qualifying format, something like a cross between BF3 in 1999 and F1 in 2004. Getting a Formula 1 drive is more explainable by the Indian concept of fate and chance. But thereafter even if luck can play a part to the one-off result for a marginal driver, continued presence in F1 often needs the basic caliber and mental forte which logically should have been evident in the feeder series on the F1 driver’s road to F1. Narain is not an outright race winner, nor is Monteiro. Narain had only 4 wins in all the races in seven years in the article above. But then in F1 today, the drive is critical. Driving for the back of the pack teams, fate and fortune can play a part like at Canada or Indianapolis in F1 2004. And finishing races could be the requirement at races, where the field has been reduced by either accidents or equipment fatigue. And the rule on tyres and one engine having to last two race week-ends, will help the slower teams. But F1 in the 21st century still remains the place for the elite, the specialized and the moneyed. What will be the career of these two debutantes in F1 is unknown. The ‘career-mortality’ rates in F1 are fearsome. Only Christian Klien of the 4 debutantes in 2004 and none of the six debutantes in 2003 are still in F1 in 2005. The 20 drivers of 2005 are debutantes from 1991 (Michael Schumacher, lone survivor from the ten who debuted in 1991), 1993 (Rubens Barrichello, another lone survivor from the eight debutantes of 1993), 1994 (David Coulthard from the 13 debutantes), 1996 (Giancarlo Fisichella and Jacques Villeneuve from the four debutantes of 1996), 1997 (Ralf Schumacher and Jarno Trulli from the six who made their debut that year), 2000 (Button and Heidfeld from the 4 debutantes of the year), 2001 (Montoya, Räikkönen and Alonso still around, Enge, Bernoldi and Yoong no longer there), 2002 (Massa, Webber and Sato still around, Davidson and McNish gone in a season), 2004 (Klien only left, Pantano, Glock and Bruni gone), and four drivers so far in 2005 - Narain, Monteiro, Albers and Friesacher. 2006 will see a change in the Formula itself - to V8, 2.4-litre engines. And usually Formula changes can change the existing order of things. Maybe all that 2005’s debutantes have to ensure is to stay there for another year and see the New F1 World in 2006. F1 Roads 2005 (so far): The four debutantes for the initial part of the season are Narain, Monteiro, Albers (German F3 champion of 1999, followed by one disappointing year in F3000, and four years of DTM) and Friesacher (German F3 in 2000 and four years in F3000).